Declaration by Cartier. This is a fresh, aromatic and woody fragrance for men. It contains of artemisia, caraway, coriander, birch, mandarin, bergamot, neroli, bitter orange, iris, ginger, cinnamon, pepper, juniper, orris root, jasmine, guatemalan cardamom, leather, amber, tea, tahitian vetiver, oakmoss and cedar. 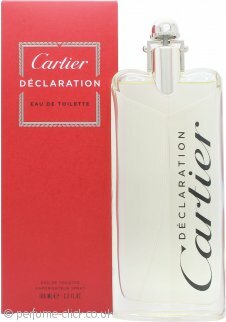 Declaration by Cartier was launched 1998.